" Integrating Joobi applications on my Joomla website was easy to configure to achieve the perfect results. Joobi's friendly tech support quickly helped me set up and manage their application saving me countless hours. Joobi offer confidence and reliability every time and would recommend very time." 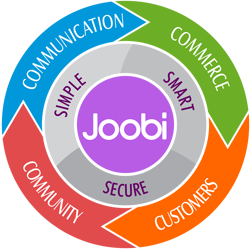 " Joobi provided us with a great framework to deploy our super-complete and futuristic multi-vendor solution, a Social eCommmerce Market deeply integrated with a social network and a referral system, in record-time. They are open to new features, and very quick to develop, with excellent results. Choosing Joobi was a great strategic decision for Mythos."